Use the Amerimax 3' Lock-In Gutter Guard to help protect your gutter from filling with debris. These gutter guards are compatible with 4", 5" , & 6" metal K-style gutters and the pre-notched design allows for overlapping which eliminates gaps between the guards. 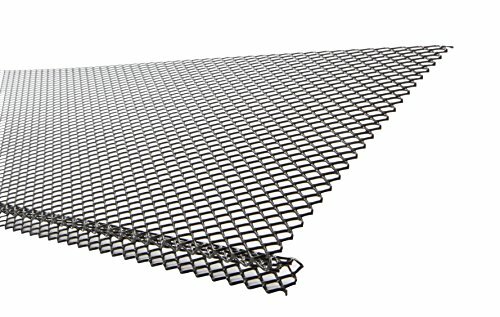 The tight expanded metal mesh pattern keeps out most debris, to keep your gutters flowing freely. Easy to install, simply slide the flat side under the shingle and lock the curved portion in to the front edge of the gutter. Made of durable powder-coated steel, this product is designed to handle high volume water flow and hold up to the heat and cold better than vinyl gutter guards. Includes a 10-year limited warranty and is Made in the USA. If you have any questions about this product by Amerimax Home Products, contact us by completing and submitting the form below. If you are looking for a specif part number, please include it with your message.